This was a radical approach to artmaking in the 1960s and ’70s in New York. Painters and sculptors working in this manner called themselves Minimalists. They used industrial materials and tried to make invisible any mark of the artist. Imagery was abstracted to essential geometric forms, sometimes only one shape or one color. Minimalist artists were reacting against 1950s artists who made emotional works showing the painterly effects of the artist’s hand. 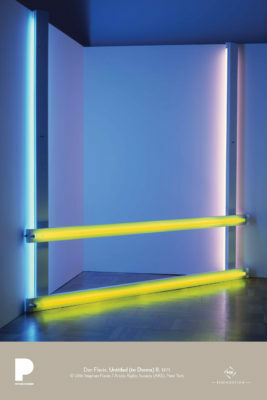 Flavin was born in Jamaica, New York, in 1933 to an Irish Catholic family. Although his father planned for him to enter the priesthood, Flavin joined the military and began to study art in Korea. After his military service, he worked odd jobs. While working as a security guard at the American Museum of Natural History, Flavin made a sketch of his first light sculpture. By the time he was 30 years old, Flavin began to work only in fluorescent fixtures and tubes. He experimented with colors, intensities of light, structure, and formlessness. He took fluorescent lights out of their everyday settings. This gave them a new and sometimes mysterious meaning. He called these works his corners, corridors, and barriers. Untitled (To Donna) II is a corner work about light, an element that you can see, but not touch. The light fixtures form a frame in the corner of the gallery. The frame marks the empty space where you see the interaction of the colored light. In this case, the lights are primary colors. Like many of his works, Untitled II is dedicated to a friend Donna. The Roman numeral “II” indicates that this is the second in a series. Fluorescent fixtures and tubes: Lamps whose inner walls are coated with a material that glows when an electric current causes a vapor within the tube to discharge electrons. Minimalism: A 20th-century art movement and style stressing the idea of reducing a work of art to the minimum number of colors, values, shapes, lines and textures. No attempt is made to represent or symbolize any other object or experience. How important is light to Flavin’s sculpture? Imagine this sculpture made from another material such as metal or wood. What could be reproduced in another material? What would be lost? Draw a sketch of this sculpture. What do you notice about its lines and shapes? Did you include the corner of the gallery, the walls, and floor as part of your sketch? Why or why not? Why do you think Flavin uses corners, corridors, and barriers as areas to display his sculptures? How would Untitled II look if it were hanging flatly on the wall? Some art historians describe Flavin’s process as “painting with light,” but colored light and pigment behave very differently. For example, mixing colored pigments across the spectrum renders paint black, while blending colors across the light spectrum creates white light. Compare Flavin’s use of light with that of an artist working in a different medium, such as Carrie Mae Weems’ photograph Untitled, from the series Kitchen Table, or Chaim Soutine’s painting Le Petit Patissier (The Little Pastry Cook). How does their use of light compare and contrast with Flavin’s? Do you think the poem’s shape resembles its subject, fluorescent light? Why or why not? In what ways is this poem Minimalist in style as Flavin’s sculpture is? Try writing your own concrete poetry by describing a corner of a room. Choose a light source: a window, a flashlight, or a lamp. What is the effect when the light is on or off? Is it best to pick an empty corner or one filled with things? What if you actually put a big picture frame in the corner? How does that change what you see?